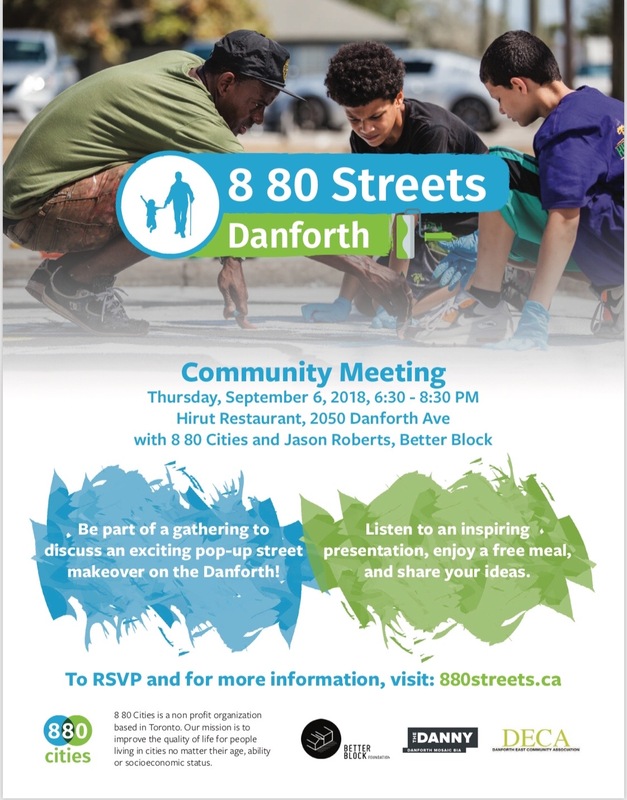 Danforth pop-up street makeover meeting on Thursday at Hirut! Do you care about making the Danforth safer, more fun and useful for people of all ages (whether you are age 8 or 80 or anywhere in between)? We do too! That’s why DECA is so excited to be partnering with 8 80 Cities, Better Block, and the Danforth Mosaic BIA to create an exciting Danforth Pop-Up Street Makeover! We’d love to have your input and ideas! Please join us for a presentation and community discussion on Thursday (tomorrow). You’ll meet some neighbours, the folks from 8 80 Cities and Better Blocks who are coming to make this amazing thing happen – and you won’t have to make dinner because Hirut is cooking for everyone. Drinks will be available for purchase. Where: Hirut Restaurant, 2050 Danforth Ave.
What: Danforth Pop-up Street Makeover Discussion and Free Dinner! When: Thursday, September 6 from 6:30 to 8:30pm. If you can, please RSVP here, or just drop by! Keen to lend a hand or know someone who might be? We’ll also be needing some pop-up street makeover volunteers who can roll up their sleeves and lend a hand to re-design the street. We’ll be using temporary paint and materials, building and installing wikiblock furniture, and overseeing program activities for neighbours of all ages. The event and prep will take place October 4th – 6th. If you are unable to attend the meeting but would like to be involved, please email gay@deca.to for more information.